Sorry for the lack of updates lately. I'm still readjusting to everything going on here. I miss posting regularly though! I wanted to quick show you all this amazing shoot that Taylor Swift did for Vogue! It was absolutely incredible and I don't think anybody was expecting how she would change her hair just because the magazine asked. Her hair's been straightened like this for well over a month now. She definitely went the extra mile for Vogue. This was her first time to appear on the cover! She looks stunning! I just got my copy in the mail today and I cannot wait to read her cover story. It is so fun to see her looking grown up and like a lady! I LOVE Taylor Swift! Your blog is great! Please stop by and follow mine! I think she looks great but I miss her pretty curls! She looks beautiful! Go Taylor! Gorgeous photos! Definitley some of the best pictures I've seen of Taylor. Wow she's growing up. She looks like a elegant woman than her older sweartheart girl image. Taylor Swift looks better with that fierce look. I love it. She doesn't like too sweetie-sweetie now. Yeah, I was really impressed with the new look! So grown up and gorgeous! 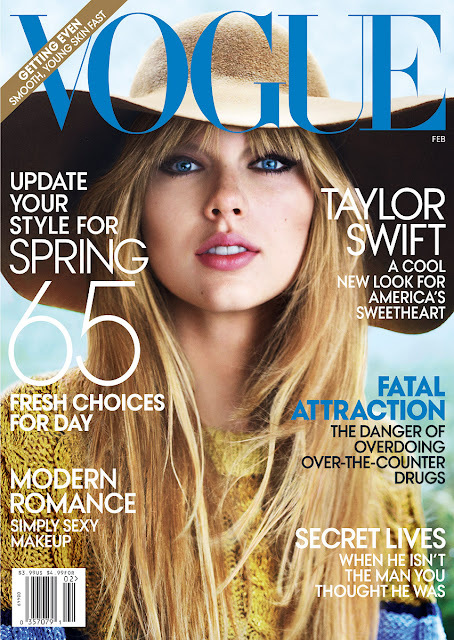 im not her biggest fan but she looks amazing on this cover!!! i have an amazing giveaway on my blog, you could win a prep pack from tommy hilfiger, go check it out!!! She looks cool & very different! I didn't even realize this was her at first! Also, I have awarded your blog the Versatile Blogger Award! It's on my blog, so check it out to see what I've said about you and your lovely blog!! I live in the city too and absolutely love it!